What’s going on at CNN in terms of their “hard news” editing process these days? The latest questionable achievement in journalism coming out of Atlanta caught my attention by way of Scott Adams’ Twitter feed yesterday, highlighting an instance where The Most Trusted Name in News ran a chyron which rather pointedly edited comments made by Republican presidential candidate Donald Trump. 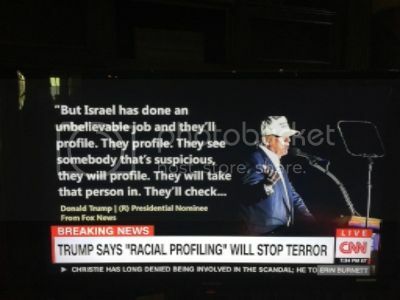 While discussing the issue of profiling and once again using Israel as an example, The Donald failed to use a word which would have made the comment far more incendiary to the Left, so CNN took the liberty of inserting it for him. The bias at the Clinton News Network is unbelievable. But then so is the stupidity. Has no one at CNN got the smarts to recognize the truth is out there and because of the net can be posted on a second's notice? Or does the truth even matter to them and their viewers? It shows in their ratings slump too. "Fox News was the most-watched channel among all of cable in total day viewers, averaging 1.29 million for the week of Sept. 5-11, nearly beating CNN and MSNBC combined."